When my pre-published* copy of Scratch Beginnings arrived in the mail, I’ll admit I wasn’t jumping up and down with anticipation. Being so consumed in the chaotic daily grind of life lately, I couldn’t imagine sitting down to read a non-fiction book about a guy who radically changed his. 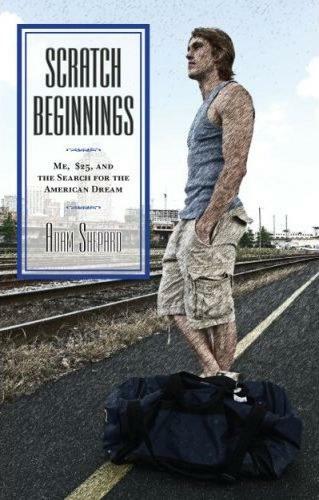 The back cover told the premise of how Adam Shepard, fresh out of college and disillusioned by the apathy he was witnessing all around him, set out with just $25 for a year with no jump start or connection to his past. He was out to prove a point to the world around him, as much as to himself. The reason I find this book so inspiring is the very reason that Adam set out on his journey to begin with. I don’t want to waste away my days, working towards the house built with grandeur. I want to be happy that I have a home at all. Genuinely happy. I don’t want to live to get by, I want to get by to live. I don’t want to be so wrapped up and consumed by what others must see in and think of my life while I’m swept up in the consumerism tide of fads and trends… In an economy that is tanking more and more, by the second, I think the release of this book is a necessary one. We’ve seen how living beyond our means isn’t helping us acheive contentment or happiness, so maybe someone’s account of the opposite can. *Scratch Beginnings was origionally self published but is now being released mass market through Harper Collins. Sounds like the story of Alex Supertramp. Must read. hey, i’ve got this one on my reading list too! *applauds* Nice review Misty – and it seems to really fit with some of the changes going on in our home at the moment! I must read this book.